Are you stressed about your Debts? 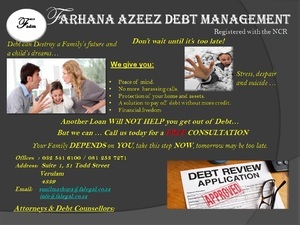 Farhana Azeez Debt Management can help you restructure the INTEREST RATES and INSTALLMENTS per creditor. DON'T DELAY AND CALL THE OFFICE TODAY!